Subscribe to our newsletter! About once a month or so we will send out a newsletter for all of our loyal readers highlighting some of the articles we’ve published, upcoming posts, and any special events (like giveaways!) we’re having. So please, join our mailing list! We wouldn’t want any of you to miss out on anything! You don’t have to worry about any spam from us, either. We hate spam. We wouldn’t subject you to any of that, because it’s annoying, and we would rather sit in a tub of ice water for half an hour before sending anyone spam. Click the link above or scan the QR code below to be taken to the signup form! 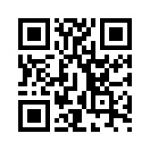 Join our mailing list by scanning this QR code!